Visitors to Paris tend to stay within the central area of the city – let’s face it, there are so much to do one need not venture further out in any case – and as a result, perhaps the only tall buildings they would have noticed are Tour Montparnasse and those at La Défense (and you can spot them right from Champs-Élysées). Otherwise, Parisian architecture seems rarely topping the sixth or seventh storey in height, much less constructed with plenty of steels, metals and glasses. 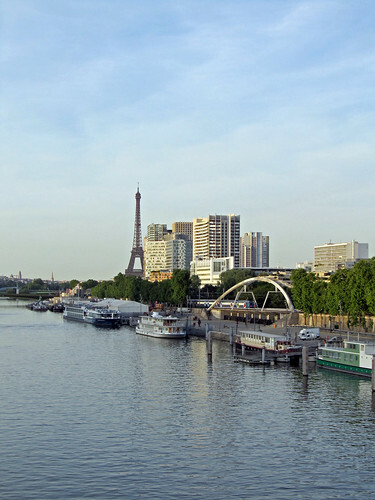 Down by Port de Javel, standing on Pont du Garigliano, one may not recognise Paris if not for the Tour Eiffel which stands beyond the horizon of tall modern buildings. It is still quite pretty here, with less human traffic (at least that was the case when I was out there this evening) and the feeling that the dynamism of Paris is something that I would need a lot of time to fully understand. I’m keeping my fingers crossed that I would be able to find time somehow to soak all the knowledge in.